I’ve been thinking long and hard for some time now on how to incorporate more umami into the food I sous vide. Being the incredibly lazy person that I am, my first instinct told me to google a product that captured the essence of umami flavour, I found 2 hits- Ajinomoto and Umami paste. Ajinomoto has long had a “bad guy” reputation for their super seasoning that is MSG, while I’m not disputing the fact that there is a tremendous amount of umami present in MSG, I find that it leaves a drying and unpleasant sensation on the tongue, there had to be a better solution. So I delved deeper into this dubious sounding umami paste, a taste test done by this website seemed to indicate a strong preference for the umami paste over traditional MSG, very intriguing, but one problem- The paste isn’t sold in Asia. I guess if I were resourceful enough, I could get someone to send me a couple of tubes, but given my short attention span(ADD? ), I was already digging through my kitchen cabinets for a solution. The answer came in a simple box of dried shiitake mushrooms. 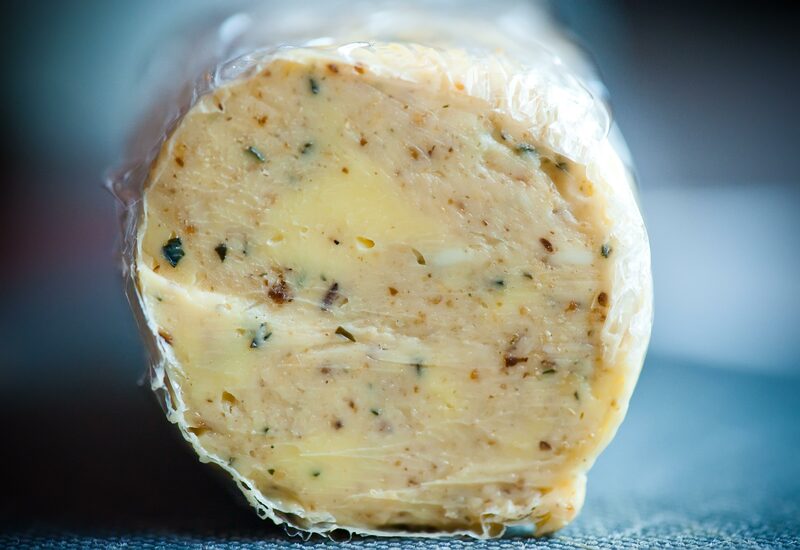 I don’t want to go through the rest of the though process, but the I ultimately ended up with a Shiitake & Kombu seaweed butter. So why Shiitake and Kombu? No good reason, simply because both ingredients have high amounts of glutamates, which the tongue perceives as umami, and because I just so happen to have found both ingredients lying around. There are tons of other ingredients high in umami- tomatoes, Dashi, parmesan cheese, fish sauce, soy sauce, ham, and so on. You can use all these ingredients, but be aware that they will impart their own flavour into whatever you are cooking it with. For example, green tea has good amounts of umami in it, but that doesn’t mean that you should be sprinkling green tea powder into every meat dish you cook right? – Finely grate the Shiitake into a powder, and finely crush the Kombu. Pass everything through a sieve to make sure that there are no large chunks. 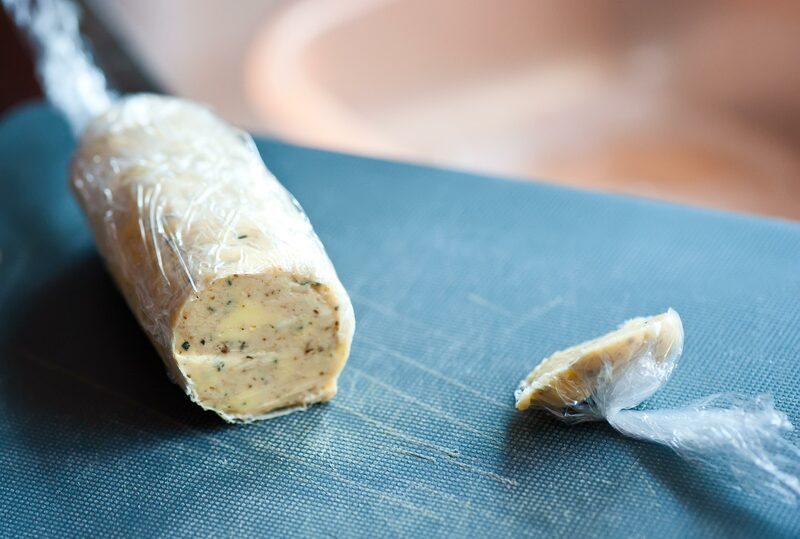 – Use cling film to mould the butter into your desired shape, then set in the refrigerator. Use as you see fit. Note that if you use salted butter, you should adjust seasoning accordingly. Actually, besides glutamate, you should aim to extract inosine monophosphate and guanosine monophosphate into your mix. These are synergistic to msg and salt, and will raise the umami power by tens of times higher than just salt and msg alone. actually, shitake mushrooms doesnt contain much msg, but has lots of gmp. rehydrated dried shitake has more gmp than fresh shitake, but gmp is a water soluble molecule that doesn’t like fat. I actually used dried shitake, but I didn’t rehydrate them. Would the oil in the butter serve a similar purpose? msg doesn’t mix in oil, but butter is 20% water, so some msg might get into into the water of the butter. harold mcgee says rehydrating shitake at room temperature and leaving them to sit vastly increases the gmp content of mustrooms, so you might want to try.